Making artists’ ideas and visions come to life is a primary goal for Arts Access facilitators. There’s no greater example of that effort than the melding of creativity that happens when client Dani Urso-King and Painting Facilitator Joseph Matousek join forces. The two come together weekly at Arts Access, a fine art program of Matheny Medical & Educational Center in Peapack. As part of the program, professional artists work as facilitators who assist the clients in creating original works of art in every discipline. Urso-King, a resident of Princeton Junction, has participated in the program since 2012. Dance and painting are among her favorite disciplines. Known for using unconventional techniques and having innovative ideas, her visual art pieces take on a life of their own. From Munny dolls (a vinyl figurine with movable parts) and oversized paintings to three-dimensional art, Urso-King enjoys testing the limits of her creativity. “There is no set process for Dani,” Matousek said of her time in the studio. “It’s different every session. Nothing is set in stone. One week, I could be melting crayons, the next week it could be something else.” Matousek, who is from Bayonne, previously worked as a scenic artist for films and companies such as Disney and Loews Portofino Bay Hotel. He has built props and sets for the Orlando Science Center, Universal’s Island of Adventure, and Sea World’s Journey to Atlantis ride. The projects he’s facilitated with Urso-King include jeans turned into an art piece on canvas and a painted tombstone interspersed with flattened twine from a Christmas tree. The latter, called ‘Death of Sesame Street’, also included elements of stuffed animals that were torn apart and put back together. 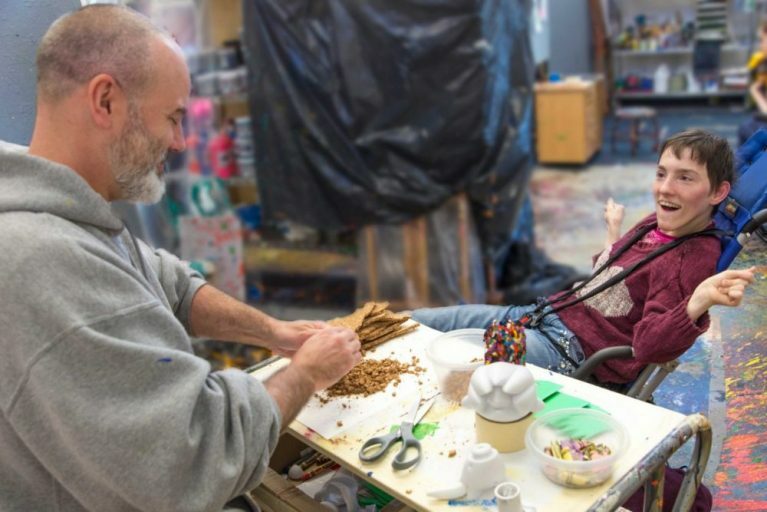 The bubbly and engaging artist, whose joyful laughter can often be heard throughout the art center, also completed a colorful 5-foot Munny figurine that features cardboard cutouts made from imprints of her feet and hands. Urso-King is currently working on another Munny. Its head will contain multiple sheets of shredded color paper that she asked the facilitator to glue together into a tubular shape. During the process, she also requested that the facilitator crumble a corkboard into small pieces and chop up a box of crayons. She’s still deciding how they will fit into the piece of art. In addition to other accolades, Urso-King was the recipient of a Dance Innovations Award in 2014. Last year, she sold one of her Munny creations at Full Circle, Arts Access’ annual multi-media showcase featuring the work of its artists. One of her art pieces and a Munny doll were on display at the 2016 Full Circle: Conversations showcase.